Just a note that another option for lowering the front 1/2" or 1" is lowering balljoints. I recently installed the 1" models on my otherwise stock-height Formula and they seems to work great. Great post! Two of us removed and disassembled the struts, modified the new struts with the grinder, assembled, installed and adjusted the ride height in under 45 minutes. and I almost spent the money to buy the already made products. Glad to hear it worked out so well, what spring rate did you go with? I used a 12" 300in/lb spring rate with 7" sleeves. Here is a few pics of my completed shocks. And what do you think about the ride? Hope that wasn't a reply to the previous post . you need a 4 corner scale to weigh each corner at the same time and adjust it to try to get some sort of balance. problem with handleing, weight transfer and braking. so would adjustments make each side weigh the same or something of the sort? bmw guru how is the ride with those? If say one rear strut is adjusted longer than the other that wheel would have more weight on it and that could effect the way the vehicle corners. It also changes the weight on the other wheels, lowering some and increasing others. I don't really understand the whole physics of it but when I used to pit crew for a friend, he would always park the car on the scales before a race and adjust the suspension to make the car hook-up better in the turns, (oval track). It helps in left turn racing to have more weight on certain wheels and less on others. It is not going to put enough weight change on any given side or wheel that any most common driver will feel just will look different on the way the car sets, unless you really over do it. Having the left side lower may help with turning left if you circle track raced it, I would say just go with a lower height tire it thats want your wanting, but for everyday driving not so much. anyone whos done this how is it working? The ride is so much better than stock...at my end. The car seems to take dips in the road much smoother. I did a little research and for my 3800 I was going to use 275 springs, but that motor with the s/c or turbo weighs as much as my V8. So, I'll be running 300 springs in my 3800 conversion. I would LOVE to do this exact same thing, only COMPLETELY opposite. This would be a boon for my BAJA project! Is there a longer spring that I could use? I will be dropping my cradle and the front crossmember about 2.5-3" and I want to put a hitch on the rear. Over-all I am looking for 4" of lift, but more weight for the rear (Towing and going to off-set weight front to rear 40/60). I have a VERY unusual project and ask all for help. I just can't believe that NO ONE has thought about thefiero as a SERIOUS BAJA! I'm not talking about the folks from PISA, that is just a dress up kit. I'm talking a full out, beat up suspention test! I hope to do the "BAJA 500" in a few years! where are you guys getting your springs from? I get my springs from summitracing.com and jegs.com. The QA1 springs are inexpensive and well-made. 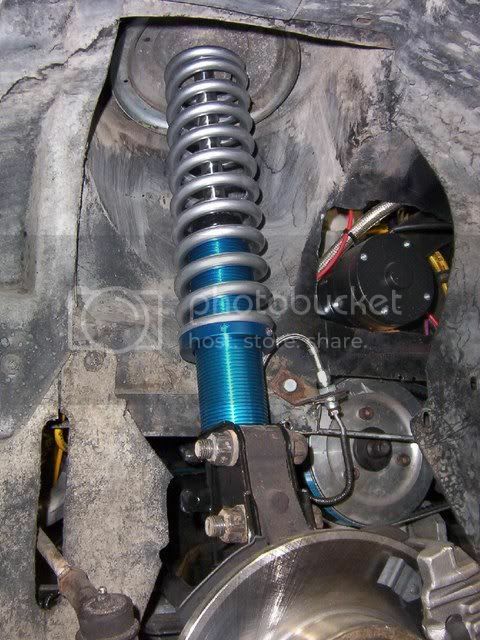 Frankenfiero1, a longer spring wont help you... there is not much travel with the Fiero struts. Set the strut so its in the middle of its travel and then build a spacer that fits between the strut top and the strut tower to get your desired ride height. you dont remember a part number off hand do ya? If you want to set up your car completely level side-to-side, jack the front wheels off the ground with a small bottle jack or floor jack exactly in the middle of the front crossmember. This eliminates the possibility of a weak or saggy spring in the front influencing your adjustment. Adjust your rear coilovers for level in the back, and you're done. 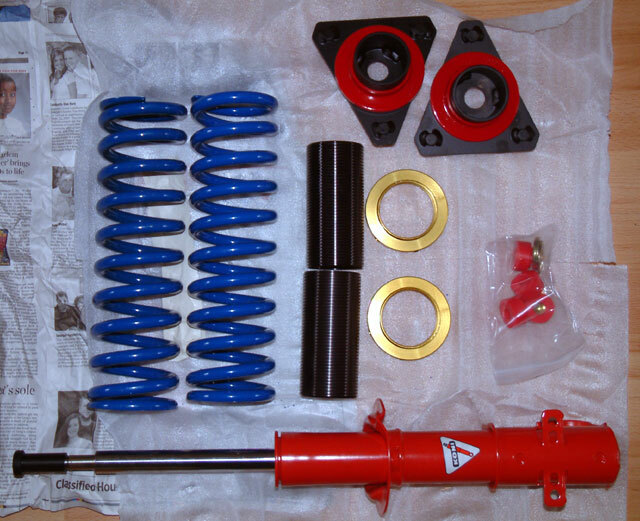 Speedwaymotors (.com), also has springs and sleeves. The 2" shock w/ coil over is heavily used in sprints and midgets. 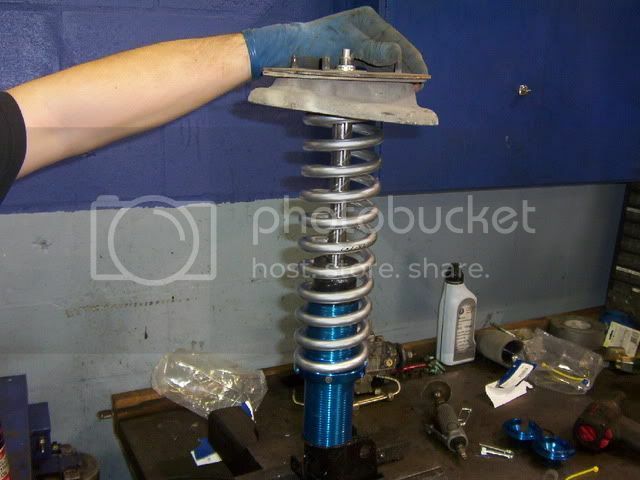 They primarily use aluminum threaded body shocks, but the springs are the same. Hypercoil, ARS, AFCO, QA1- are all reputable. I'd probably go with one of the powder coated ones like hypercoil over the chrome for durability, since rusting away is the only way you lose spring rate with a coil (unless you heat them). You can also get covers for these springs. They vary from velcro'd on nylon to foam lined vinyl. They are used on dirt cars to protect the shock body from rocks and increase seal life. As far as the scaling and cross weight discussion, yes, adjusting the coil so that is raises that corner increases weight on that corner (preload). You've got a pretty good left/right balance in the fiero as is, so I'd just shoot for level ride height side to side. Your shock rates and difference in spring rate front to back will effect handling far more than the static heights will. Is everyone using the ID of 2 5/8 (2.625) or using the 2 1/2 (2.50) because the 2.5 there are plenty, the 2.625 not so much! I may have missed it through all the pages of this thread, but what is the OD of the strut body? Just wondering how much clearance is being allowed between the sleeve and the strut body. 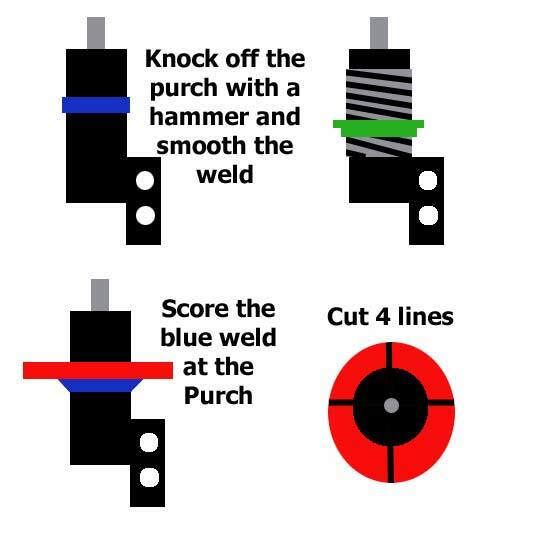 I would never buff the purch weld all the way off the strut. First thing I did was score the weld on the purch side all the way around the strut. Then I cut the part of the purch that goes around the strut so the large back half could be removed by hitting it with a hammer. This let the back half of the purch come off the strut and left all the weld on the strut. I then did the same thing to the front of the purch. Then I took my sleave and slowly ground down the weld till it would slid over the strut, I didnt have to take that much off the weld and you cant see it when the sleave. I am using Helds kit but the same would apply here. Either should work, as they are both used on the same sleeves- which mimic a 2" threaded body racing shock. 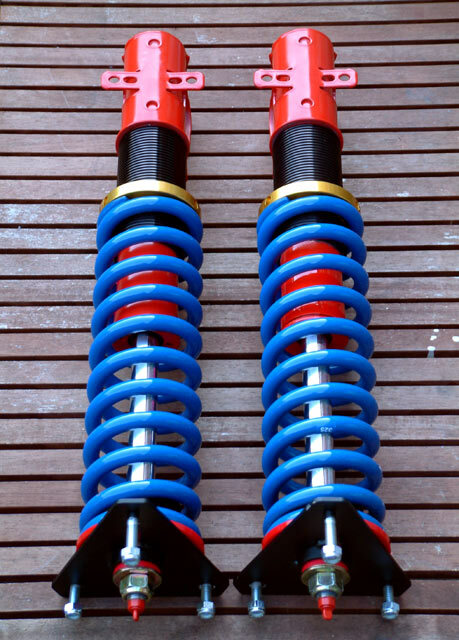 Obviously, the 1 7/8" springs won't work, as they are intended for 1 5/8 "small body" racing shocks. The ride is just as good as any other spring as long as you pick a conservative spring rate such as those mentioned above. The part numbers I used are in this thread about half way down. I'll include the link for you in case you looking for more information. Here is the work I did on our 88 w/ pics. It isn't coilover because I wanted to keep it stock (wife's car - her choice). But you'll be able to see what different on an 88 anyway. Mainly the sway bar. The coilover stuff is all the same. You might need to grind just a bit on the hub to allow for chamber adjustment. Ours had just barely enough play to almost make it to the minimum spec. We left it there. --- Aslo, it looks like my webhost's server is down. $10 a year. I'm not gonna complain. The pics may be down now but they will be back. Looks good Fie Ro! I think I am going to go ahead and order that same kit.